Wednesday, May 22nd, 2013 . At UberConference, I do a ton of calls – usually 1 or 2 every day. I’ve been doing conference calls since I was 21. I began my career in sales, selling hardware and software for a Fortune 500 Chicago tech company. This was 1999, and one of the things that the company didn’t tell me, when they were recruiting me, was that I’d be spending 7 or 8 hours a day on sales calls, on the phone. (It was pretty naive of me to assume that being a corporate account manager meant something other than that, huh?). I really wish that before I’d taken that job, and before I’d started my own business, that I got a bit of sales advice about conference call outcomes. Six weeks into the job, when I began taking my first sales phone calls, small business customers called in over what was called “the sequencer.” Essentially, it was the company’s 1-800 number; marketing then consisted of hundreds of thousands of computer hardware and software catalogs, mailed to pretty much every company in the USA with more than 5 employees. Sometimes you got a great sales call off of the sequencer – perhaps you’d get a 5-laptop order, worth roughly $100 in commission. Sometimes it was someone cold-calling from Miami trying to order 20 laptops – those deals were nearly always fraudulent. The goal of these early calls was “sell something on every call.” What I didn’t realize, at the time, was that the goal of every sales call is definitely not “to sell something.” It’s to help the buyer make a yes-or-no decision that they feel really good about. One thing I’ve learned in sales, especially from reading Skip Miller’s books, Proactive Selling and Proactive Sales Management, is that the sales process involves getting agreement from the buyer (and everyone that works with the buyer) on a series of intricate yes-or-no decisions. Yeses are great. No’s are pretty darn good, too. It’s the “maybes”, says Miller, that will kill you. When a sales meeting results in a “no,” it means that the seller has encountered what’s called a “basic objection.” Usually, it’s one of 4 problems: buyer has no need, buyer has no budget, buyer has no authority, or buyer has no urgency. Most of the last three are linked to the first one – the fact that the buyer either has no genuine need, or the seller did a lousy job helping the buyer figure out if he had any need. If the meeting doesn’t end in a “yes” or a “no” on the next buying action, then the meeting was not a successful meeting. The fancy name for maybes, in sales, are “continuances.” What they really are is a failure to accomplish anything substantial in the sales meeting. What qualifies as an advance to the next stage in the buying process on this call? How will I know when my buyer has advanced to that next stage? What critical yes/no decisions would my buyer need to make in this meeting? Have I communicated the meeting’s agenda to my buyer in advance, and adequately prepared the buyer for the meeting? Do I have validation from the buyer that the meeting’s agendas meet his buying objectives, business pain and need? One other thing that I do after my calls – immediately after the end of the call – is allow an extra 10 minutes on my calendar to do a wrap-up. This is where I enter the necessary info into my CRM system (Salesforce), and plan what decisions I’d need to help my customer make on the next call. Give that a shot the next time you finish a sales UberConference – I think you’ll be pretty surprised by the results. Tuesday, May 14th, 2013 . 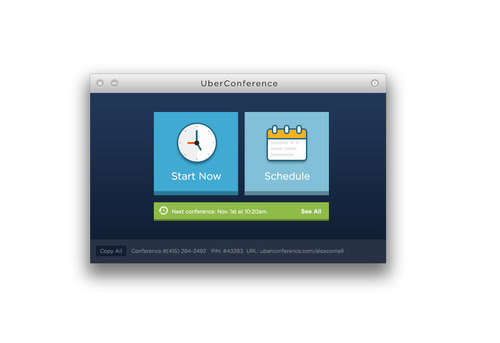 Today we announced that UberConference will showcase its packaged app in the Google I/O Developer Sandbox on May 16 & 17. Google I/Ois an annual developer conference featuring highly technical, in-depth sessions, and showcasing the latest from Google’s product teams and partners. The UberConference team has been invited to demonstrate its implementation of WebRTC in packaged apps and connect with I/O attendees developer-to-developer to answer questions and exchange ideas. Packaged apps’ cross platform capabilities will allowUberConference to run smoothly on Chromebooks, Windows and Mac, requiring code only to be written once. Our implementation of WebRTC in packaged apps delivers a more seamless and powerful WebRTC experience to our users. Once installed, the user never has to click ‘allow’ again to enable a WebRTC connection to UberConference. Another benefit stems from packaged apps’ native-app-like capabilities. As an example, if you have a conference call starting, we can notify you on your desktop whether or not you have the browser open, and you can see or join the conference directly from the app.If you are going to be at Google I/O, make sure to stop by and see us. Tuesday, May 7th, 2013 . 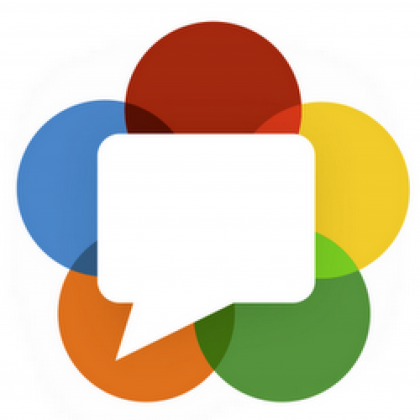 So, what is Web Real Time Communication (WebRTC), anyway? The idea isn’t new but people who use voice and video conferencing are beginning to hear it every day. 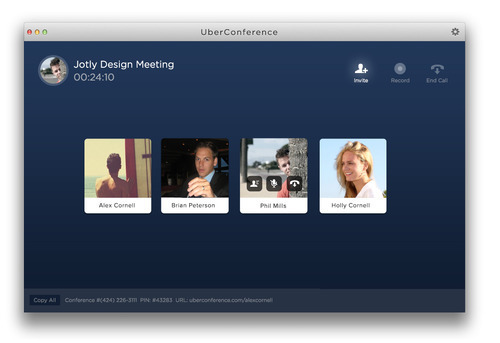 At UberConference we use it to make it easy to join conference calls over the Internet from anywhere. WebRTC allows real-time voice, video, and data to stream between two people using a web browser. There’s no need for plugins or third-party software, only the latest Chrome or Firefox. Until recently, web browsers were where you did pretty much everything except conferencing – web surfing, email, watching videos. However, the biggest disadvantage of the web browser was that it was lousy at two-way voice and video calls. That kind of real-time communication had been challenging for companies for many years because the voice and video compression-decompression algorithms (called codecs) were really expensive. Only a few companies owned them, and they charged pricey licensing fees. In addition, browsers could only request data or send it upon request, not send and receive it in real time, as video chat requires. To understand this, consider that browsers have been evolving ever since their creation to allow us to do more and more on the web. Plugins were introduced in the mid-late ’90s, which allowed developers to play videos with flash, facilitating a move toward the beginning of video communication. Then, in 2004, the browser language HTML5 developed the <audio> and <video> tags to allow this multimedia content to live in your browser without the need of a plugin. However, real time communication (RTC) remained a challenge because browsers lacked a method to send and receive data in real time, and often the stumbling block were the expensive codecs used to interpret the media communications between users. For WebRTC to be truly effective, everyone needed access to the high quality codecs. In 2010 Google took on the challenge and purchased two companies: GIPS and On2. This turned the VoIP market on its head. Here’s why: GIPS was a leading provider of VoIP codecs, On2 had a video codec that rivaled the H.26 standard. And Google open sourced them both, giving the RTC industry a giant push forward. That’s why WebRTC has been a big deal for UberConference and for all Internet users. It lets them conference in real-time without having to mess around with applications or phones or leave their web browser. This is a huge benefit for emerging companies, who, ten years ago, would have paid significantly higher costs for hardware and services to set everything up. They can now build their companies with a much lighter – and cheaper- footprint. Now that’s something to call your CEO about.